I love vintage suitcases, I really do. Sometimes, I would spend whole afternoons digging around garage sales around neighbourhoods, just looking for that right one to prop up my living room, or my kitchen. Such suitcases are perfect for adding that touch of whimsicality to an otherwise boring house. Many have asked me how I use such old, antique suitcases as part of my house’s decorations, so I have scouted around the web and find for my readers a few ways that you could spice up your dwelling with vintage suitcases. Look for a set of 3 vintage suitcases of the same or similar colours, or perhaps there could be one odd one that seems mismatched but it stands out in a fun or unique way. This can also act as a charming piece of side table in a well-planned living room. Artist Mandy Heath shows us how to turn vintage suitcases into unique home decor shelves or shelving units. You can then put in your souvenirs and memorabilia from your overseas trips and adventures, or even ad your own travel tags to the suitcases. Find out how Mandy did it here. See what Donna from FunkyJunkInteriors do with her antique suitcase – she turned it into a funky old trunk and bean sack ottoman and coffee table! (4) Wall Storage Units You can use an antique suitcase also as a wall storage unit. This will work best in a stylish bathroom or powder or makeup room. You can use it to store makeup items, keys, toiletries, for instance. For boring tables, you could add on a piece of vintage suitcase underneath a decorative lamp, or even add legs beneath an old suitcase and let it act as a cool piece of conversation starter. It also save you the time and effort to find a conventional table or side table. Watch how set and prop designer Dane Holweger transformed an old, vintage suitcase into a rolling bar, for storing his glasses, wines, beers and drinks, and also for putting his ice bucket and moving it around! 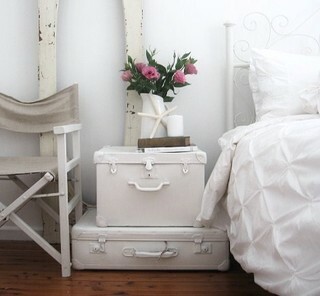 Create an interesting side table or centrepiece when you paint your antique suitcases. For instance, paint it in white and let it blend into a white-based room or living room together with the white sheets, chairs and beds. But be careful when painting leather as you need to wipe it down with alcohol and sand it to remove surface dirt and wax before you start to paint. 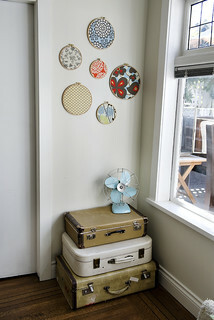 Check out more interesting ideas on how to decorate your house with old, vintage suitcases. Kalden Rose, the nerdy student which always emerges top in the school. The kind that would rather be burying his nose in a bunch of books than playing a game of football. But he does like to visit garage sales. If you do too, connect with him at kalden@vxotic.com.